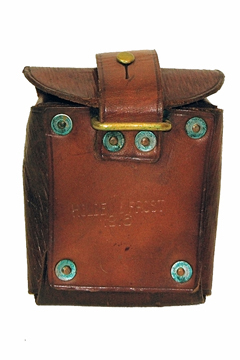 This pouch was used by the Light Horse troops of WWI. 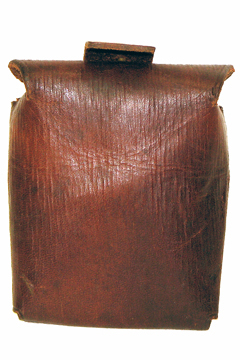 It is one of two types that was worn on tunic belts and sometimes used in combination. It holds 15 rounds of ammunition. The pouch has a small leather tongue that closes the pouch by attaching to a stud pillar on the top of the front flap. On the rear of this pouch is a belt loop (see 2nd photo). Additional to this is a brass 'rectangle', for attaching a great coat carrier for the dismounted infantry. The pouch has been cleaned up and has had leather dressing applied. Considering that it is a genuine WWI issue, it is in excellent condition and will suit any serious collector.